Pierre the Maze Detective is a part of a series of sticker books designed by IC4Design that will delight sticker collectors of all ages. Pierre is on a new adventure through Opera City. Along with Carmen and Mr. X, Pierre travels through some amazing scenes where the reader has to find some special items to add to his new picture wall where he keeps all of his special photos from his adventures. 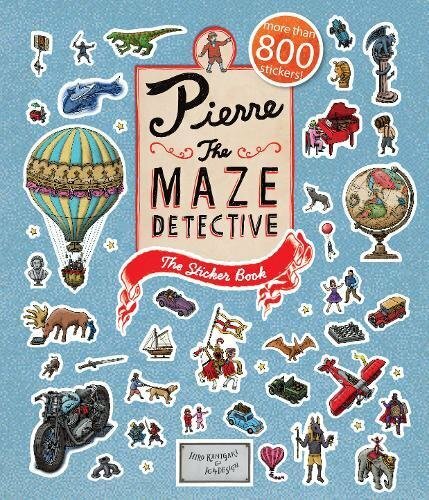 This book contains 800 stickers from the books counterpart Pierre the Maze Detective: The Search for the Stolen Maze Stone. Readers who are familiar with that book will love searching through the familiar scenes looking for some sticker spotting challenges along the way. Those who are not familiar will love the “Search and Find” feel as you travel in dozens of air balloons above the city, through detailed and amazing museums, libraries, and treasure rooms looking for specific items. The illustrations are colorful, attractive, and full of life as they draw the reader’s eyes into their detailed and cluttered depths. Sticker lovers of all kinds, as well as your “Search and Find” fanatics, will enjoy what this 44-page sticker book adventure has to offer.